Are you looking for easy to use way to check PageRank & related details of your blog or website? Portable tool WebSeoAnalyzer makes this all easy and quick. It neatly show only the relevant information of Pagerank of specific website or blog URLs. You can analyse further to see pagerank, outlinks and inlinks for individual URLs of specific blog or website. 1. Download WebSeoAnalyzer & unzip the file. 2. 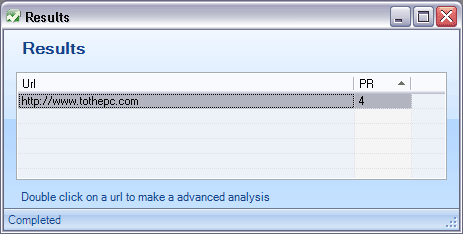 Click the WebSeoAnalyzer icon to launch program (no install). 3. Enter any URL to see its pagerank information (as shown below). 4. Double click on specific URL to see further details of specific URLs of blog / website URL along with individual details of pageRank, outlinks, inlinks and percentage of nofollow links. (as shown below). WebSeoAnalyzer for sure one handy program to check juicy pangrank details of different URLs of a blog or website. It is pretty quick as there is no jumping around from one webpage window to another that happens while using web based pagerank checker tools. Hi… we had a change from pagerank 0 to 2 on our project tus-hasede.blogspot.com on October 23rd. Can anybody explain why? There has been no general pagerank update that day. Thaks a lot for a nice informative post. I just downloaded the said software and it’s really nice and easy to use. While the tool is useful, you can get these services online now. This does seem like a great tool. Just wondering, are there any issues with giving up some privacy when using WebSeoAnalyzer for PR, etc, like there is with Google toolbar PR app? Downloaded the freeware app and the UI is cool (much like vista). But it also shows the css files :o Is it the same for you as well?